Capricorn Research has to admit to being not very inspired by the curriculum at secondary school. The defence for this was one of relevance. It is a peculiar trait of the sign that they are only interested in acquiring knowledge that can be of demonstrable use to them. Whilst it’s easy to accept primary school education as being useful in terms of learning to read and add up, once you reach the age of 11 the pursuit of knowledge becomes more and more academic and this particular Capricorn became less and less interested. This might appear to be an exceptionally narrow minded approach to education but it does have its advantages. As soon a study of some relevance came along in Astrology, Capricorn Research was ready to jump in with both feet and a few brain cells still intact. So much of the GSE and A Level experience was ignored, but there was one particular study that whilst being just as irrelevant to the requirements of a teenager in the late 1960s, it still grabbed the attention. This was history but most particularly that of the 16th Century and even more than that, a short period of time between about 1516 and 1532. This was the period of the Reformation, when the most profound changes occurred and the whole concept of state and religion was thrown into disarray. It was an interesting time but why should it stick out so specifically for this particular triple Capricorn. It’s because Pluto was going through that sign at the time and was largely responsible for all the challenges to the accepted traditions for those two great Capricornian institutions of church and state. Henry VIII was on the throne of England but it was not really that particular Cancerian’s obsessions with his own fertility that was of most interest, it was the goings on in Europe. And according to many of the traditional authorities in Europe, Pluto was propelling the continent straight to hell. Whenever Pluto travels through a sign there is a theme of change to and even destruction of the known conventions of the time. This is often symbolised by a particular event that occurred midway through the period which sweeps away everything that had gone before. The Plutonic event of this period was Martin Luther’s nailing of his 95 Theses to the Wittenberg church door in 1517. Luther strongly disputed the claim that freedom from God’s punishment for sin could be bought. Roman Catholic theology stated that faith alone, whether fiduciary or dogmatic, cannot justify man, justification rather depends only on faith that is active in charity and good works, such as donating money to the church. Luther taught that salvation and subsequently eternity in heaven is not earned by good deeds but is received only as a free gift of God’s grace through faith in Jesus Christ as redeemer from sin and subsequently eternity in Hell. His theology challenged the authority of the Pope by teaching that the Bible is the only source of divinely revealed knowledge from God. Luther of course was excommunicated for his trouble, a fate considerably more scary than it might be perceived these days. This did not seem to bother him too much as he went on to set up the Reformed Church. But then Martin Luther had 4 planets in Sagittarius, the Sun, Mercury, the rebellious Uranus and the religious Neptune and this sign is seldom afraid to speak its mind particularly on philosophical matters. It is hard to dismiss Luther’s views, after all if someone offered to smooth over the passage to heaven for your dearly departed grandad in exchange for a couple of grand, you would wonder if you had stepped onto a Monty Python set. But this was accepted religious practice in those days and as the church and state were effectively the same thing, people just viewed it as a version of inheritance tax. This church / state thing was intriguing. Even these days there are many countries in the world whose political leaders tie themselves to a religious belief to give a higher meaning to their pronouncements, but in the early 16th century everything was run by the Pope and a few kings. There even existed something called the Holy Roman Empire which was a multi-ethnic complex of territories in central Europe that developed during the middle ages and continued until its dissolution in 1806. And during the time in question this was run by the Emperor Charles V. Charles amassed an enormous amount of territory during his reign and its not entirely clear how he got it all, countries just seemed to offer themselves to him. Charles started out by inheriting his father’s Burgundian territories which is basically The Netherlands, Belgium, Luxemburg and a few other bits and pieces, commonly known as the Low Countries. This was a vitally important part of Europe because of trade and industry and brought a lot of money into Charles’ treasury. Besides this, Charles had a couple of very powerful grandfathers, Ferdinand 11 of Aragon and Maximilian I, the Holy Roman Emperor. Aragon consisted of basically the right hand half of Spain and rather bizarrely Naples, Sicily and Sardinia.The Holy Roman Empire at the time consisted of all of Germany, Austria, the Czech Republic and bits of Poland, France, Italy, Slovakia, Hungary, Croatia and Denmark. The position of Emperor was elective but we should not confuse this with any kind of democracy. Its was generally handed over to whoever already had the biggest pile as long as he was in with the Pope. When Ferdinand of Aragon died, the country passed to Charles’ mother, Joanna but for some reason Maximilian and Pope Leo X and the House of Burgundy wanted Charles to have Aragon so that was what happened. Charles then seemed to acquire Castile ( the rest of Spain ) by negotiation. One advantage of being King of Spain meant that he got the Spanish territories in the Americas as well. During Charles’ reign these were considerably extended by conquistadores like Cortés and Pizarro, who conquered the large Aztec and Inca empires and incorporated them into the Spanish Empire. These successes convinced Charles of his divine mission to become the leader of Christendom. The conquests also helped solidify Charles’ rule by providing the state treasury with enormous amounts of gold. After the death of his paternal grandfather, Maximilian, he inherited the Habsburg Monarchy. He was also the natural candidate of the electors to succeed his grandfather as Holy Roman Emperor. He defeated the candidacies of Frederick III, Elector of Saxony, Francis I of France, and Henry VIII and became Holy Roman Emperor in 1519. By this time his empire spanned nearly four million square kilometers across Europe, the Far East, and the Americas and as the conquests in the New World had been set in motion by his predecessors it seemed that he had acquired all this without so much as lifting a sword. Keeping it all, however would be a different story. It was a well known fact in 16th century politics just as in any other field that if you stand still you end up going backwards, so to preserve his empire, Charles felt it was necessary to fight the one country in mainland western Europe that he didn’t already own, France. He was also much engaged in repelling the Ottomans from the Empire’s eastern borders. Charles professed to be a lover of peace but was always at war. Unlike most rulers who continue until death, he retired at the age of 54 exhausted by his role as Emperor and spent his last four years in a monastery. 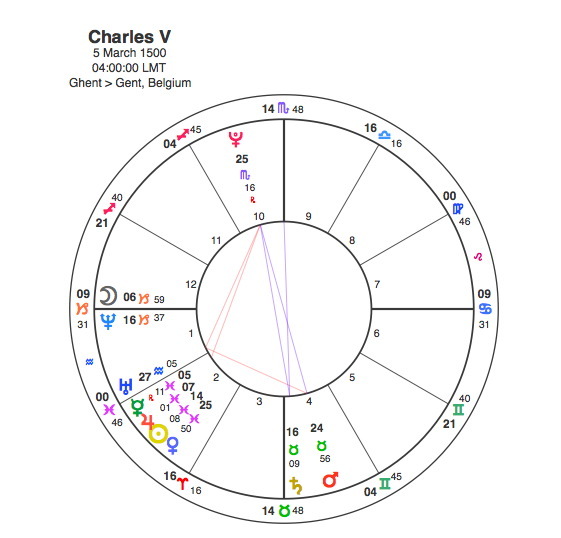 What kind of chart should we expect for someone like Charles V ? Well probably not this one on the face of it but if we look deeper we can see the logic. Charles had 4 planets including the Sun in Pisces, not a sign that you would instantly associate with rulers of vast empires. A Sun / Jupiter conjunction on the other hand is exactly what would be required. Jupiter works very well in Pisces, it was the ruler of the sign until Neptune was discovered. Charles Sun / Jupiter is in the 2nd house of money and he certainly had a lot of that. One of the issues with Jupiter in the 2nd house is while it provides a lot of dosh it gives endows a great capacity to spend it all as well and with this combination in Pisces vast quantities of cash would be frittered away in all directions. It does seem hard to believe with all that New World gold, but by the end of his reign, Spain was bankrupt. It would be interesting to do research on bankruptcies, it would be a fair bet that there would be many more Jupiterians who had overspent relative to their means than their frugal and tightfisted Saturnian counterparts. In a sense Pisces does really fit the experience because it is a sign that knows no boundaries. Charles’ empire was so vast that it was relatively ungovernable and he was constantly having to shore up different borders. It was literally like trying to contain a fast flowing river, you can build a dam but the waters will just find another way out. Charles also had the Moon / Ascendant and Neptune conjunct in Capricorn, so he was essentially a politician and a conservative one at that. This shows how he came to such power as a result of family ( the Moon ) and religious ( Neptune ) influence together with a pragmatic ability to control things and bring together authoritative groups for support ( Capricorn ). With the Sun in Pisces and the Moon conjunct Neptune he was a very religious man but his Capricorn connections emphasised his place on the side of the Catholic church. It was on his watch, however that the Reformation occurred and this is shown in his chart by a T Square. This is based on an opposition between Mars in Taurus in the 4th house, a very strong symbol of tradition and the power of authority and the revolutionary Pluto in Scorpio at the top of the chart. From the perspective of Mars in Taurus in the 4th, Pluto in Scorpio in the 10th could easily give the impression that the whole world was going to hell. This opposition focuses by T Square onto the revolutionary Uranus so the result as far as Charles was concerned was anarchy. Of course Charles was a strong old school Catholic ruler ( Moon / Ascendant conjunct Neptune in Capricorn ), yet he was unable to hold back the rise of Protestantism ( T Square apex Uranus )within his own Empire. He wanted to but just did not have the time to do it as he was constantly engaged in dealing with the problems of such a disparate Empire ( Sun conjunct Jupiter in Pisces ). This whole episode is quite instructive in the way that historical astrological themes work. The theme for Pluto’s journey through Capricorn was the overthrow of conventional religious doctrines and their political dominance. When Pluto moved into Capricorn in 1516 no one had ever heard of Protestantism, by the time it moved out in 1532 the Reformation had acquired an unstoppable momentum. Pluto was at 2 degrees Capricorn when Luther pinned his theses to the church door but in order for this to avoid being instantly stamped out the Holy Roman Emperor of the time needed to be distracted by the political demands of a vast empire. 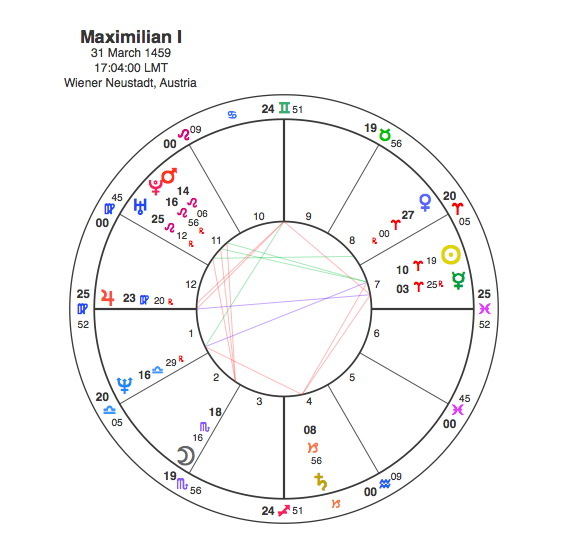 Maximilian I, the emperor at the time was a Sun Aries with Jupiter rising and the Moon in Scorpio in square to a vicious Mars, Uranus, Pluto conjunction in Leo. He also had a relatively small empire to cope with that was focused on Germany so its very likely he would have stamped the Protestant movement out before it had started crawling. So in 1519, just as Pluto was coming close to square his Sun, Maximilian died and everyone started looking from for a successor. In 1517, Pluto was conjunct Charles Moon so he inherited the throne of Aragon and the rest of Spain and the New World soon followed. In 1519, Pluto was conjunct Charles’ Ascendant so he got the Holy Roman Empire as well. So these transits to Charles’ chart were all an important part of Pluto’s journey through Capricorn and the necessity for change in Europe at the time. It is interesting to note that Maximilian had a Mars / Uranus / Pluto conjunction whereas Charles had all three pulling powerful in completely different directions as part of his T Square. So it seems likely that Maximilian could have dealt with the Lutherans but Charles was just too stretched. This was one time when the Empire couldn’t strike back.